My poster for my talk with guest spot by Tim McConnell (Undergraduate Research and Leadership Scholar). 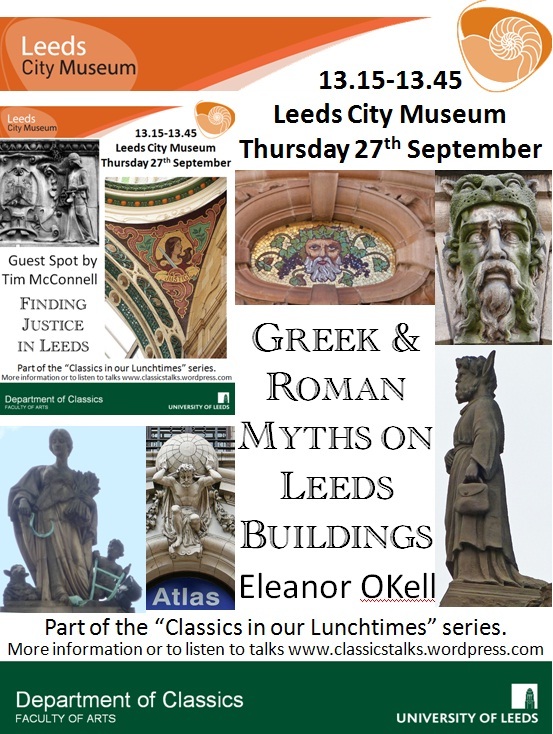 Eleanor OKell “Greek and Roman myths on Leeds Buildings” will reveal some of the characters who appear in architectural sculpture in Leeds, asking whether and why the character’s portrayal communicates a story, and wonders why they were considered appropriate decoration. Tim McConnell (Undergraduate Research and Leadership Scholar) has a guest spot to talk about the personification of Justice in Leeds and how her portrayal and locations confound expectation! 24 audience members enjoyed the talk on the day. Many thanks for the suggestion that Abtech House’s Justice carries a Roman steelyard if they had head-shaped weights, seems to be the case from looking at this example – we wonder whether the instructions to the scupltor were not specific enough? Two audience members requested that the walks to which I referred be made available in easily printable form here, so here they are. I just have to post this! A fellow research scholar, Tim McConnell has given a talk at Leeds City Museum concerning ‘the personification of Justice in Leeds’. Wonderful to see another scholar doing so well. Good on ya Tim!